Rarely, a company official or elected politician must resign due to personal or professional misdeeds. 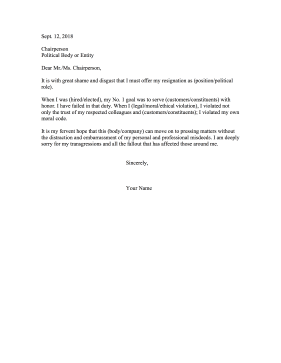 This letter, which includes an apology, is for resigning in disgrace and shame. It is with great shame and disgust that I must offer my resignation as (position/political role). When I was (hired/elected), my No. 1 goal was to serve (customers/constituents) with honor. I have failed in that duty. When I (legal/moral/ethical violation), I violated not only the trust of my respected colleagues and (customers/constituents); I violated my own moral code. It is my fervent hope that this (body/company) can move on to pressing matters without the distraction and embarrassment of my personal and professional misdeeds. I am deeply sorry for my transgressions and all the fallout that has affected those around me.